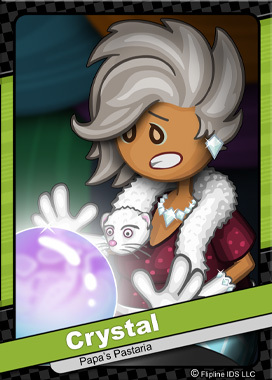 Crystal is a self-proclaimed clairvoyant, and runs a fortune-telling service called Crystal’s View. She is accompanied everywhere by her mischievous pet mink named Cannoli. Crystal can be a rather polarizing Portallinian. Some pay big money for a reading, while others think she is just an eccentric kook. Once a week, Crystal and Cannoli treat themselves to a delicious dinner at Papa’s Pastaria. ← Papa’s Pizzeria To Go #14!! !